Railpictures.ca - Doug Page Photo: You can almost hear this train straining to crest the Dundas hill at Inksetter’s Road near Copetown. This westbound has an interesting variety of power: CN GP40-2LW 9449, NS C30-7 8035 (at the time, on lease to CN), GTW GP40-2 6423, CN SW1200RSu 7311, and GP9u 4123…oh, to have caught this on video! | Railpictures.ca – Canadian Railway Photography – photographie ferroviaire Canadienne. Caption: You can almost hear this train straining to crest the Dundas hill at Inksetter's Road near Copetown. 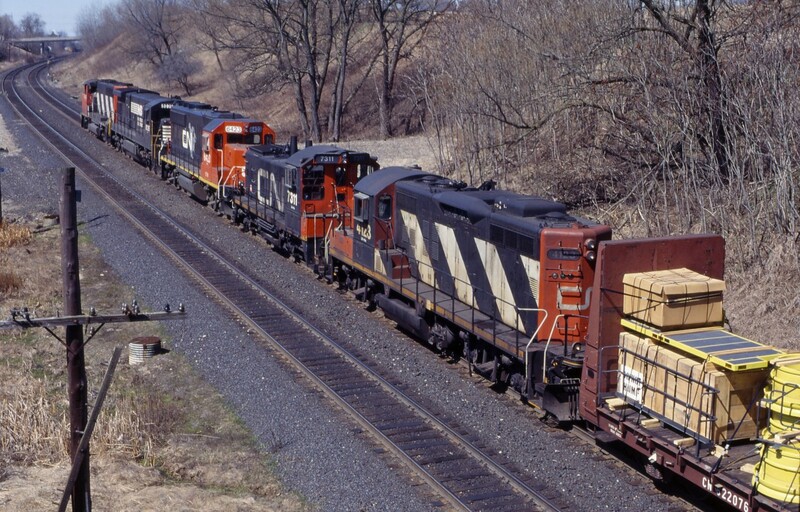 This westbound has an interesting variety of power: CN GP40-2LW 9449, NS C30-7 8035 (at the time, on lease to CN), GTW GP40-2 6423, CN SW1200RSu 7311, and GP9u 4123...oh, to have caught this on video!